A stylesheet is available here. 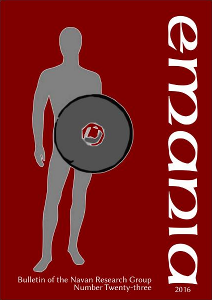 Backissues are available from our distributor curach bhán publications (Berlin) at a price of € 11.00 / £ 9.49 (incl. VAT) plus postage (up to and including issue no. 20) per issue. Backissues from no. 21 and forthcoming issues: € 20.00 / £ 16.50 (institutions: € 30.00 / £ 24.50) per issue. Subscription price of forthcoming issues: € 15.00 / £ 12.40 (institutions: € 22.50 / £ 18.40) per issue. Warner, R.B. : Preliminary schedules of sites and stray finds in the Navan complex, 5-9. Anon. : Notes and queries: origins of the names Loughnashade, the King's Stables, Haughey's Fort; boundary stone at Creeveroe; the farm owned by 'Rocks'; unrecorded finds/sites in the vicinity of the Navan complex, 9. Bell, Sydney: On Navan Fort, 10. Lynn, C.J. : Navan Fort: a draft summary of D.M. Waterman's excavations, 11-19. Baillie, M.G.L. : The central post from Navan Fort: the first step towards a better understanding of the Early Iron Age, 20-21. Anon. : Two early modern descriptions of Navan [John Colgan, c. 1592–1658 and John O'Donovan, 1809–1861], 22-23. Mallory, J.P.: A provisional checklist of Emain Macha in the annals, 24-27. Ferguson, Sir Samuel: The Twins of Macha, 28. Hartwell, Barrie: An air photographic survey of the Navan area, 5-11. Mallory, J.P.: The literary topography of Emain Macha, 12-18. Stuart, J.: Historical Memoirs of the City of Armagh (1819); Reprint: Two Early Accounts ot the Discovery of the Loughnashade Trumpets, 19-20. Browne, A. and Steward, James: Two early accounts of the discovery of the Loughnashade trumpets [Browne, A., An Account of some Ancient Trumpets, dug up in a Bog near Armagh, TRIA 8, 1802, 11-12; Steward, James (ed. ), Historical Memoirs of the City of Armagh, (1819), 608], 19-20. Paterson, T.G.F. : The Loughnashade dragon [originally published in: Paterson, T.G.F. (ed. ), Country Cracks: Old Tales from the County of Armagh (1939)], 20, 36. Raftery, Barry: The Loughnashade Horns, 21-24. Weir, David A.: The earlier limits of Loughnashade, 25-28. Hamill, Paddy: Notes and queries (Rock Farm, reply), 28. Bell, Sydney: Notes and queries (thanks for publishing his poem, and a few comments), 28. Lambkin, B.K. : Patrick, Armagh, and Emain Macha, 29-31. Mallory, J.P.: Draft proposals for a Navan Heritage Centre, 32-35. Campbell, Noreen: Comment on the draft proposal, 36. Walsh, Aidan: Excavating the Black Pig's Dyke, 5-11. Williams, Fionnuala: The Black Pig and linear earthworks, 12-19. O'Donovan, Patrick: An Cladh Ruadh: a travelling earthwork from Co. Kerry, 20-21. Lynn, C.J. & McDowell, J.A. : Two unrecorded monuments near Navan, County Armagh?, 22-27. Tarzia, Wade: No trespassing: border defence in the Táin Bó Cuailnge, 28-33. Weir, David A.: Palynology and the environmental history of the Navan area: a preliminary study, 34-43. Campbell, Crawford W.: A proposal for rehabilitation, 44-47. McGarvey, Feargus: Rehabilitating Navan, 48. Mallory, Jim P.: Trial excavations at Haughey's Fort, 5-20. Hartwell, Barrie: A soil resistivity survey at Haughey's Fort, 21-23. McCormick, Finbar: Animal bones from Haughey's Fort, 24-27. Weir, David A. & Conway, Malachy: Haughey's Fort: a preliminary palaeobotanical analysis, 28-31. Warner, R.B. : Notes and queries: decorated stone found and destroyed at The King's Stables some time before 1910, 31. Toner, Gregory: Emain Macha in the literature, 32-35. Warner, R.B. : Loch Cirr/Cúl Chíre, 36. Baillie, M.G.L. : The dating of the timbers from Navan Fort and the Dorsey, Co. Armagh, 37-40. Lynn, C.J. : A small excavation of the Dane's Cast, Killyfaddy, Co. Armagh, 41. Lynn, C.J. & McDowell, J.A. : Muirchú's Armagh, 42-46. Waddell, John: Rathcroghan in Connacht, 5-18. Ó hUiginn, Ruairí: Crúachu, Connachta, and the Ulster Cycle, 19-23. Mallory, Jim P.: A provisional checklist of Crúachain in the Annals, 24-26. Mallory, J.P. & Baillie, M.G.L. : Tech ndaruch: the fall of the house of oak, 27-33. Manning, Conleth: A note on sacred trees, 34-35. Mallory, J.P. & Warner, R.B. : The date of Haughey's Fort, 36-40. Forbes, Will: Notes: letter to the editor (mention of Emain in marginal note in Chronicum Scottorum, 40. Mallory, Jim P.: Notes: omissions (addenda to checklist for Emain Macha), 40. Hughes, A.J. & McDaniel, Eilís: A nineteenth-century translation of the Deirdre story, 41-47. Lynn, C.J. : An interpretation of the Dorsey, 5-10. Baillie, M.G.L. & Brown, D.M. : Further dates from the Dorsey, 11. Condit, Tom & Buckley, Victor M.: The 'Doon' of Drumsna: gateways to Connacht, 12-14. Lynn, C.J. : Linear earthworks in Drummiller, Co. Down, and Goragh, Co. Armagh, 15-16. Buckley, Victor M.: The Dowagh: an early account of the Dane's Cast, 17. Lynn, C.J. : A bibliography of northern linear earthworks, 18-21. Mallory, Jim P.: The career of Conall Cernach, 22-28. Cahill, Mary: A note on two items of correspondence relating to Navan, 29-30. Simpson, D.D.A. : Neolithic Navan?, 31-33. Weir, David A.: A radiocarbon date from the Navan Fort ditch, 34-35. Mallory, J.P.; McAlister, J.J. & Davison, John: Ditch sediments from Haughey's Fort, 36. Anderson, R.: Haughey's Fort: analysis of an insect death assemblage, 37-42. Hamlin, Ann: Notes and Queries: 'lost' sites in the Navan area, 42. Cochrane, Robert: Notes and Queries: on vesting Navan, 42. Waddell, John: Notes and Queries: corrections: Rathcroghan, 42. Hughes, A.J. & McDaniel, Eilís: Bryson's translation of the story of Deirdre (part 2), 43-47. Lambkin, B.K. : Navan Fort and the coming of 'Cultural Heritage', 48-49. Ó hUiginn, Ruairí: The literature of the Laigin, 5-9. 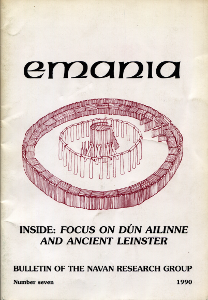 Wailes, B.: Dún Ailinne: a summary excavation report, 10-21. Crabtree, Pam: Subsistence and ritual: the faunal remains from Dún Ailinne, Co. Kildare, Ireland, 22-25. Johnston, S.A.: The Neolithic and Bronze Age activity at Dún Ailinne, Co. Kildare, 26-31. Grabowski, Kathryn: The historical overview of Dún Ailinne, 32-36. O'Brien, Elizabeth: Iron Age burial practices in Leinster: continuity and change, 37-42. Forbes, Will: The first recorded archaeological find at Emain Macha, 43-45. Warner, R.B. ; Mallory, J.P. & Baillie, M.G.L. : Irish Early Iron Age sites: a provisional map of absolute dated sites, 46-50. Buckley, Victor M.; Condit, Tom; Haigh, John G.B. & MacGarry, Damian C.: A resistivity survey of the eastern entrance at the 'Doon of Drumsna', 51-53. Hughes, A.J. & McDaniel, Eilís: Bryson's translation of the story of Deirdre (conclusion), 54-58. Hartwell, Barrie: Recent air survey results from Navan, 5-9. Mallory, J.P.: Excavations at Haughey's Fort: 1989-1990, 10-26. McCormack, Finbar: The animal bones from Haughey's Fort: second report, 27-33. Hawthorne, Mark: A preliminary analysis of wood remains from Haughey's Fort, 34-38. Baillie, M.G.L. & Brown, D.M. : A dendro-date from Haughey's Fort?, 39-40. Lynn, C.J. : A burnt layer beside the King's Stables, 41-42. Warner, R.B. 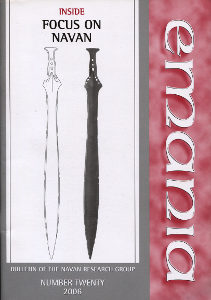 : The Drumconwell Ogham and its implications, 43-50. Lynn, C.J. : Knockaulin (Dún Ailinne) and Navan: some architectural comparisons, 51-56. McCormick, Finbar: Evidence of dairying at Dún Ailinne?, 57-59. Toner, Gregory: Cormac Conloinges – the hero of the Mound, 60-62. Waddell, John: The question of the Celticization of Ireland, 5-16. Koch, John T.: Ériu, Alba and Letha: when was a language ancestral to Gaelic first spoken in Ireland?, 17-27. Raftery, Barry: The Celtic Iron Age in Ireland: problems of origin, 28-32. 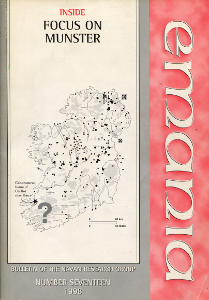 Cooney, Gabriel & Grogan, Eoin: An archaeological solution to the 'Irish' problem?, 33-43. Warner, R.B. : Cultural intrusions in the Early Iron Age: some notes, 44-52. Mallory, J.P.: Two perspectives on the problem of Irish origins, 53-58. 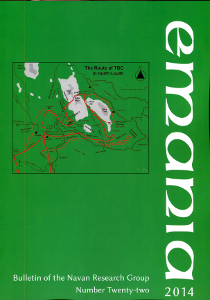 Condit, T.; Gibbons, M. & Timoney, M.: Hillforts in Sligo and Leitrim, 59-62. Woodman, Peter: A tanged 'Bann' flake from near Navan, 63. Mallory, J.P.: Further dates from Haughey's Fort, 64-65. Lanting, J.; Brindley, A.; Buckley, V. & Condit, T.: Preliminary Carbon-14 dates from the Doon of Drumsna, 66. Olmsted, Garrett: The earliest narrative version of the Táin: seventh-century poetic references to Táin bó Cúailnge, 5-17. Hollo, Kaarina: The feast of Bricriu and the exile of the sons of Dóel Dermait, 18-24. Robertson, David A.: The Navan forty meter structure: some observations regarding the social context of an Iron Age monument, 25-32. Lynn, C.J. 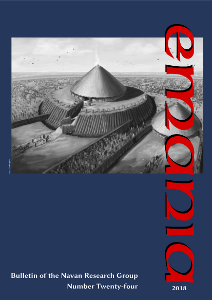 : The Iron Age mound in Navan Fort: a physical realization of Celtic religious beliefs?, 33-57. Mallory, J.P.; Simpson, D.D.A & Hartwell, B.N. : Excavations at Ballyrea, Co. Armagh, 58-65. Bourke, Cormac: The Ballyrea brooch, 66-67. Hartwell, B.N. 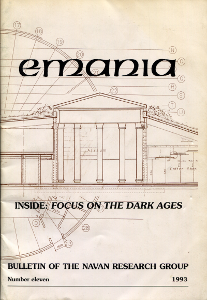 : Index to Emania 1–10, 68-76. Baillie, M.G.L. 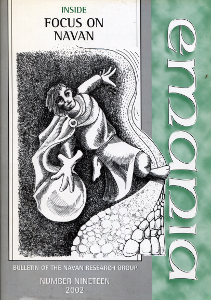 : Dark Ages and dendrochronology, 5-12. Warner, R.B. : Tree-rings, catastrophes and culture in Early Ireland: some comments, 13-19. Weir, David A.: Dark ages and the pollen record, 21-30. Ó hUiginn, Ruairí: Fergus, Russ and Rudraige: a brief biography of Fergus Mac Róich, 31-40. Battaglia, Frank: A common background to Lai de Graelent and Noínden Ulad?, 41-48. Crothers, Norman: Further excavations at Ballyrea townland, Co. Armagh, 49-54. Musgrave, B.W. & Crothers, J.W. : The Navan Centre project, 55-59. Lambkin, B.K. 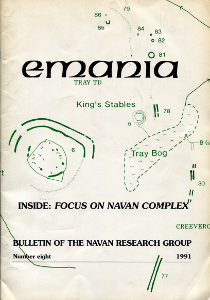 : Navan Fort and the arrival of 'Cultural Heritage', 61-64. Lynn, C.J. : Hostels, heroes and tales: further thoughts on the Navan mound, 5-20. Warner, R.B. : The 'Ernean House', 21-27. Mallory, J.P.: The fort of the Ulster Tales, 28-38. Warner, R.B. : The Navan Complex: a new schedule of sites and finds, 39-44. 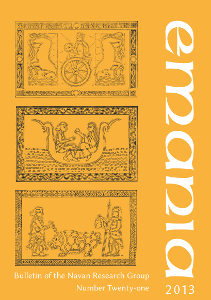 Freeman, Philip M.: Visions from the dead in Herodotus, Nicander of Colophon, and the Táin Bó Cúailnge, 45-48. Sayers, William: Supernatural pseudonyms, 49-60. Cribbin, G.; McCormick, F.; Robinson, M.E. & Shimwell, D.: A destroyed late Iron Age burial from Kiltullagh, Ballyglass Middle td., Co. Mayo, 61-65. Warner, R.B. 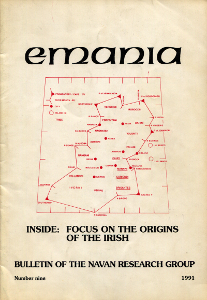 : Emania Varia I A: Summary of the chronology of Navan, 66. Warner, R.B. 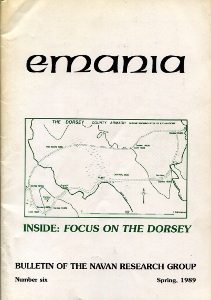 : Emania Varia I B: The date of Haughey's Fort refined, 67-69. Warner, R.B. 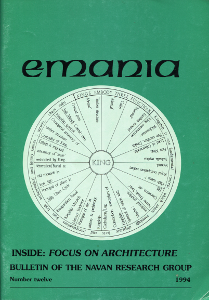 : Emania Varia I C: More on Conmáel and Óenach Macha, 69-70. Warner, R.B. 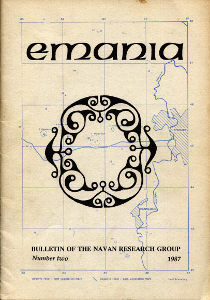 : Emania Varia I D: Navan in the eleventh century, 70-72. Raftery, Barry: Pre- and Protohistoric Ireland: problems of continuity and change, 5-9. Freeman, Philip M.: Greek and Roman views of Ireland: a checklist, 11-13. Mytum, Harold: Across the Irish Sea: Romano-British and Irish settlements in Wales, 15-22. Warner, R.B. : Tuathal Techtmar: a myth or ancient literary evidence for a Roman invasion?, 23-32. 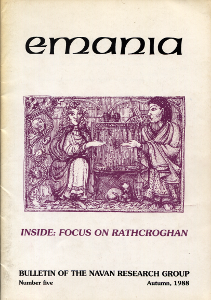 McCormack, Finbar: Cows, ringforts and the origins of Early Christian Ireland, 33-37. Koch, John T.: The conversion and the transition from Primitive to Old Irish, c. 367 - c. 637, 39-50. Thomas, Charles: Cellular meanings, monastic beginnings, 51-67. Baillie, M.G.L. : Patrick, comets and Christianity, 69-78. Mount, Charles: Excavations at Rathdooney Beg, Co. Sligo, 1994, 79-87. 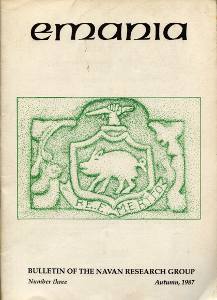 McCormick, F.; Cribbin, G.; Robinson, M.E. ; Shimwell, D.W. & Murphy, E.: A Pagan-Christian transitional burial at Kiltullagh, 89-98. Mallory, J. P.; Moore, D. G. & Canning, L. J.: Excavations at Haughey’s Fort 1991 and 1995, 5-20. Boreland, Dorcas: Late Bronze Age pottery from Haughey’s Fort, 21-28. Neill, Marie: Haughey’s Fort excavation 1991: analysis of wood remains, 29-46. Murphy, Eileen & McCormick, Finbar: The faunal remains from the inner ditch of Haughey’s Fort, third report: 1991 excavation, 47-50. 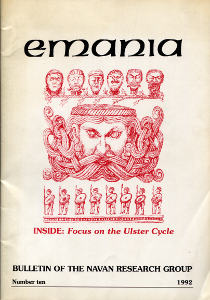 Muhr, Kay: The East Ulster perspective on the Ulster Cycle tales, 51-63. Sayers, William: Homeric Echoes in Táin Bó Cúiailnge?, 65-73. 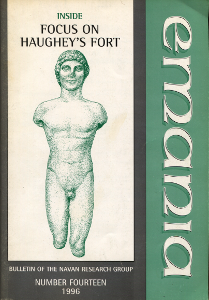 Sterckx, Claude: A Celtic Apollo at Navan?, 75-76. Warner, Richard: Navan and Apollo, 77-81. 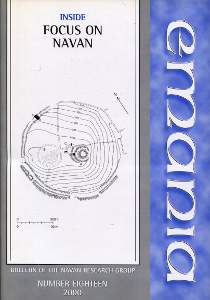 Kvamme, Kenneth L.: Proton magnetometry survey at Navan Fort, 83-88. Lynn, Chris: That mound again: the Navan excavations revisited, 5-10. Larson, Daniel O. & Ambos, Elizabeth: The goals of the Navan project, 11-13. Ambos, Elizabeth L.; Larson, Daniel O.; Kvamme, Kenneth; Conway, Malachy & Cibbarelli, Shawn: Remote sensing surveys of Navan Fort, 15-32. Weatherup, Roger: Conor, Cú Chulainn and me, 33-37. 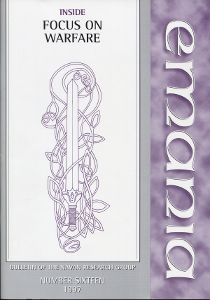 Candon, Anthony: Tealach Óc and Emain Macha c. 1100, 39-46. 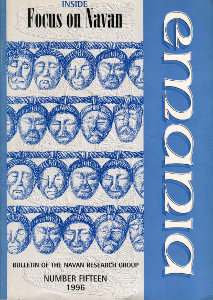 Ó Béarra, Feargal: Táin Bó Cuailnge: Recension III, 47-65. Aitchison, Nicholas B.: Votive deposition in Iron Age Ireland: an Early Medieval account, 67-75. Sadowska, Ewa: "Horses Led by a Mare" — martial aspects of Táin Bó Cúailnge, 5-48. Sayers, William: Contracting for combat: flyting and fighting in Táin Bó Cúailnge, 49-62. Lyle, Emily: Age grades, age classes and alternate succession: a restatement of the basis at the societal level of Indo-European symbolic partition, 63-71. Jennings, Rachel: A translation of the Tochmarc Treblainne, 73-78. Hellmuth, Petra Sabine: A giant among kings and heroes: some preliminary thoughts on the character Cú Roí mac Dáire in medieval Irish literature, 5-11. Woodman, P.C. : The Early Iron Age of South Munster: not so different after all, 13-19. Raftery, Barry: Observations on the Iron Age in Munster, 21-24. Warner, R.B. : Is there an Iron Age in Munster?, 25-29. Aitchinson, Nick: Late Bronze Age ritual at Haughey's Fort: the evidence of the deposited cup-and-ring marked stone, 31-39. McComb, A.M.G. : The carbonized hazel nut shell fragments from feature no. 283 at Haughey's Fort, Co. Armagh, 41-44. Baillie, M.G.L. & Brown, D.M. : Further evidence confirms the twelfth century BC dendro-date from the inner ditch of Haughey's Fort, 45-46. Mallory, Jim P. & Ó Donnabháin, Barra: The origins of the population of Ireland: a survey of putative immigrations in Irish prehistory and history, 47-81. Avery, Michael: When did Irish reach Ireland: a query, 83. Mallory, J.P.: Mesolithic modems and fantasy sheep: a reply to Michael Avery, 84-85. Lynn, C.J. : Navan Fort Site C excavations, June 1999: interim report, 5-16. Murphy, Eileen M..: Report on the osteological material from Site C, Navan Fort, Co. Armagh, 17-19. Mallory, J.P.: Excavations of the Navan Ditch, 21-35. McCormick, Finbar: The animal bones from the Navan Ditch, 37-38. Warner, R.B. : Keeping out the Otherworld: the internal ditch at Navan and other Iron Age ‘hengiform’ enclosures, 39-44. Taylor, John: The ancient Irish in Classical ethnography, 45-48. Ford, Patrick K.: The Ulaid and the Iliad: some considerations, 49-56. Allen, N.J.: CúChullain’s women and some Indo-European comparisons, 57-64. Robinson, M.E. ; Coombs, D.; Maude, K. & Shimwell, D.W. (with contributions from P. Bodkin & C. Rye Mattick: Early Christian inhumations on Kiltullagh Hill, Co. Roscommon, 65-73. Hall, Allan: A puffball from Haughey’s Fort, Co. Armagh, Northern Ireland, or the Armagh ‘Apple’ unmasked, 75-76. Corlett, Christiaan: Cup-and-rings, and the mapping of Haughey’s Fort: a suggestion, 77-78. Lynn, C.J. : Navan Fort Site C excavations, May 2000: interim report (no 2), 5-18. Dunlop, W.; Lynn, C. & Pullin, K..: A note on an experimental burning at Navan, Co. Armagh, 19-23. Gault, Andrew: Applying Bayesian mathematics to the Navan Fort radiocarbon chronology, 25-34. Warner, R.B. : A newly discovered Iron-Age ‘pendant’ from Navan, 37-42. Ó hUiginn, Ruairí: Oileamhain Con Cualainn: ‘Cú Chulainn’s Training’, 43-52. Wiley, Dan M.: Stories about Diarmait mac Cerbaill from the Book of Lismore, 53-59. Russell, C.: Regionalism within Bronze Age Ireland, 61-73. Alberro, M.: Celtic heritage in the North-west of the Iberian Peninsula, 75-84. Lynn, C.J. : Some Iron Age figure-of-eight plan structures in Ireland: problems of interpretation with particular reference to the example from Navan, Co. Armagh, 5-19. Warner, R.B. : The Tamlaght hoard and the Creeveroe axe: two new finds of Late Bronze Age date from near Navan, Co. Armagh, 20-28. Conway, Malachy: Survey and excavation in the Navan Environs with 'Time Team': Creeveroe, Haughey's Fort and Ballydoo, 29-52. Johnston, Susan A.: Revisiting the Irish royal sites, 53-59. Schrijver, Peter: Early Irish Ailenn: an etymology, 60-61. Plunkett, Gill: Hekla 3, environmental downturns and Irish Late Bronze Age hillfort connections revisited, 62-67. Ford, P.K. 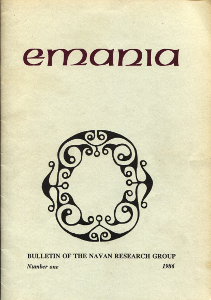 : Ul na n-Ulad: ethnicity and identity in the Ulster Cycle, 68-74. Sayers, William: Portraits of the Ulster hero Conall Cernach: a case for Waardenburg's syndrome?, 75-80. Tsvetoukhina, Maria; Mikhailova, Tatyana & Bondarenko, Grigory: The Ulster Cycle in Russia, 5-13. Leenane, Mary: Cú Chulainn's ríastrad and related contortions, 15-19. Warner, R.B. : Ptolemy's Insamnion promontory: rehabilitation and identification, 29-52. Ó Néill, John: Lieutenant-General Alexander Campbell's Loughnashade horn, 31-34. Warner, R.B. : A lost, Iberian-style, Bronze Age gold neck-ring from near Navan, Co. Armagh, 35-39. Hunt, C.O. : Fire, rush lights and pine at Navan, 41-46. Ginn, Victoria: Power to the people: reinterpreting Bronze Age society, 47-58. Baillie, M. & Brown, D.: A chronological framework for the period from 208 BC to AD 600, 59-71. Coyle McClung, Lisa: The Late Iron Age lull – not so Late Iron Age after all!, 73-83.
de Vries, Rank: The Ulster Cycle in the Netherlands, 5-11. 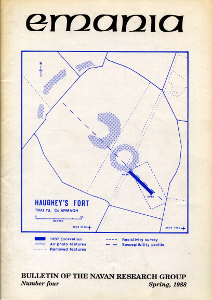 Mallory, J.P. & Baban, G.: Excavations in Haughey's Fort East, 13-32. McClatchie, Meriel: Food production in the Bronze Age: analysis of plant macro-remains from Haughey's Fort, Co. Armagh, 33-48. Baban, Gina: Late Bronze Age pottery from the excavations at Haughey's Fort East, 49-58. Brandherm, Dirk: Late Bronze Age casting debris and other base metal finds from Haughey's Fort, 59-68. Warner, R.B. : The gold fragments from Haughey's Fort, Co. Armagh: description and XRF analysis, 69-76 (access supplementary material to this article). Maguire, Rena: The Y-piece: function, production, typology and possible origins, 77-98 (access supplementary material to this article). Ó Foghlú, Billy: Irish Iron Age horns, and the conical spearbutt of Navan: a mouthpiece investigation, 99-125. Lynn, Chris: Some Pictish symbols: leatherworking diagrams and razor holders?, 127-135. Bondarenko, Grigory: A 'Kshatriya Revolution' in the Ulster Cycle?, 137-144. Gosling, Paul: The route of Táin Bó Cúailnge revisited, 145-167. O’Brien, William: Clashanimud and the Bronze Age hillforts of Munster, 5-30. Macdonald, Philip: Excavations at Knock Dhu promontory fort, Ballyhackett, Co. Antrim 2008, 31-49. Schot, Roseanne; Waddell, John & Fenwick, Joe: Geophysical survey at Rathcroghan 2010-2012, 51-59. Warner, R.B. : The linear earthwork known as 'the Danes Cast': early descriptions, general observations and a newly recognised extension at Newtown, Co Armagh, 61-66. 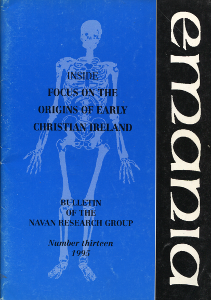 Gibbons, Michael & Gibbons, Myles: The Brú: A Hiberno-Roman cult site at Newgrange?, 67-78. Kerr, Thomas R.: A comparative overview of warfare in Early Medieval Ireland – AD 600-800, 79-93. Waddell, John: Equine cults and Celtic goddesses, 5-18. Hicks, Ronald: The rout of Ailill and Medbh: myth on the landscape, 19-34. Fenwick, Joe: The late prehistoric ‘Royal Site’ of Rathcroghan, Co. Roscommon: an enduring paradigm of enclosed sacred space, 35-51. McCarthy, Mike & Curley, Daniel: Exploring the nature of the Fráoch Saga – An examination of associations with the legendary warrior on Mag nAí, 53-62. Ó Drisceoil, Cóilín & Walsh, Aidan: New radiocarbon dates for the Black Pig’s Dyke at Aghareagh West and Aghnaskew, County Monaghan, 69-79. Brandherm, Dirk; McSparron, Cormac; Kahlert, Thorsten & Bonsall, James: Topographical and geophysical survey at Knocknashee, Co. Sligo – Results from the 2016 campaign, 81-96. Wilkinson, Anthony: Knocknashee – Local perceptions, 97-98. McCafferty, Patrick: The fear of fairy forts: archaeological preservation by plague and superstition, 99-106. By subscribing, you will automatically receive future issues.